Grammy-nominated The Dufay Collective has been performing and recording its unique brand of early music for nearly three decades, winning awards and wide-spread critical acclaim along the way. I Have Set My Hert So Hy marks the group’s return to the recording studio with a collection of 15th century songs and instrumental numbers, much of which has been expertly reconstructed by the ensemble’s director William Lyons. 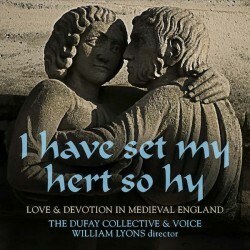 On this recording, The Dufays collaborate with vocal trio Voice, recreating the essence of music written for and heard in the royal courts and religious houses of Medieval England.